So the time has come that you need to start thinking about Murphy log home restoration services. When that time does arise, make the wise choice and partner up with Taskmasters Wood Maintenance. 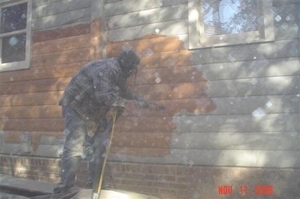 We are the fast and friendly independent mobile North Carolina wood restoration and pressure washing team. We work with both residential and commercial customers and believe in going above and beyond when it comes to addressing the needs of our clients. While we have several areas of specialty, log cabin restoration happens to be one of the most widely requested. It is difficult to find someone as dedicated to this line of work, as we are. In fact, it is a challenge to even find many professionals dedicated to this line of service work anymore, and certainly not as much as we are. Let us walk you through the services that we offer in order to help you better understand the options that you have. This will help to ensure that you get the final results that you hoped for and the quality level that you deserve. Log Home Restoration – Whether it is your full time home, part time home or an investment property you use for rental-based income, we want to be a part of helping you restore your log home. There is nothing quite as alluring as the rustic charm of a log cabin and we look forward to helping you restore and renovate yours. Residential Pressure Cleaning – Getting the exterior of your home clean is an important but challenging task. Let us help make that possible by taking care of your residential pressure cleaning. Soft Wash Roof Cleaning – Not all areas of your exterior are appropriate for cleaning with pressure washing, such as your delicate rooftop. We know the steps to take in order to provide you with a deep and thorough clean, without putting your rooftop at risk of damage. Taskmasters Wood Maintenance is the number one name to call on for all of your wood restoration and pressure washing services. We take this line of work seriously and that is evident from the results that we are able to get for our clients. Make the wise decision to call on us today so we can begin working on your project. We look forward to working with you and demonstrating, in person, what a difference true quality makes. If you're looking for a professional log home restoration in Murphy, then give us a call 252-266-9457 or complete our online request form.